If you are searching for a crossover SUV with a comfortable luxury cabin, great gas mileage, and plenty of room for the whole family, Land Rover Colorado Springs has the perfect vehicle for you. 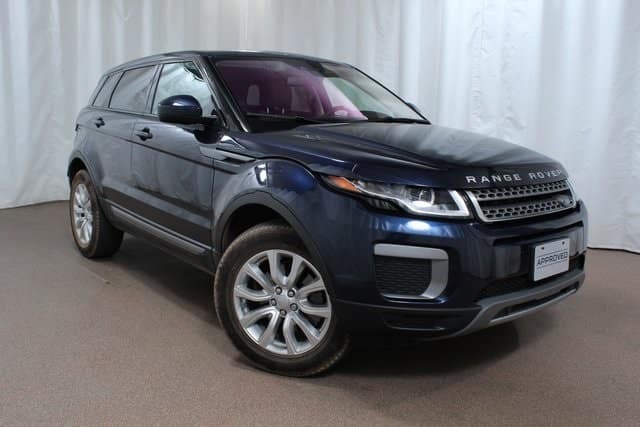 We currently have an Approved Certified Pre-Owned 2017 Range Rover Evoque SE in our inventory. This stunning Loire Blue Metallic Evoque was part of our service loaner program, so our customers drove it a little and you save a lot! With just over 9,000 miles on the odometer, this beautiful SUV is in excellent condition. Enjoy a suite of premium luxury amenities including premium Almond leather heated front and rear seats, convenient SD Navigation with voice control, SiriusXM satellite radio, heated windshield and washer jets, exterior parking camera, chrome wheel locks, Brake Assist and much more! The 2.0L 240-horsepower 4 cylinder engine is both responsive and fuel-efficient, earning an estimated 21 MPG in the city and 29 MPG on the highway. This sporty all-wheel drive sport utility vehicle is the “total package”. Enjoy peace of mind with a Land Rover Approved Certified Pre-Owned 5 year/100,000 mile limited warranty, 24/7 roadside assistance, and the convenience of Land Rover Concierge. Stop in to Land Rover Colorado Springs for your test drive today! Test out the many exciting features and check out the spacious seating and cargo areas with room for the whole family and their gear!